I put a Drop 1.2x in my 10g back in March. The tank was started in December 2017 and was established when I added the Drop. Despite very significant algae growth all over the tank, only a little yellow slimy algae grows in the scrubber. I've never seen any hair algae grow in this tank. Tank occupants are a small longhorn cowfish, a yellow prawn goby and a single large emerald crab. I feed abut 1/2 a cube per day and don't have any cleanup crew. 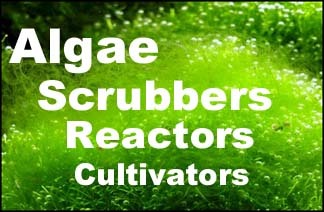 I have a larger reef system that is beautifully maintained by a scrubber producing large balls of green hair algae. I tried putting a clump into the Drop but this didn't help. Below are pictures. Thanks for the help! What's going on is the super thick periphyton on the top of the rocks is keeping nutrients low in the water, and the red light in the scrubber is too strong for these low nutrients. Especially if you are not using the black shade screen, which it looks like you are not. So use the black screen, and go to 18 hours light. Bubbles are 24 hours of course. Once the white surfaces get covered by a thin slime layer, the reflections of light will be less, and you can remove the shade. Then green hair will attach after you have brushed out the slime in your sink a few times. Thanks. I replaced some of the rock with rock from the sump of my larger system, and scraped some from the back wall. Adjusted light and put the black screen back in as you said. Would it help if I stopped skimming? I scrubbed of most of the yellow slime from inside the scrubber. Tank looks gross with all the algae, periphyton as I learned, but the water conditions and fish are super healthy. The cowfish has grown a bit and I'll be swapping to an old 34g AIO Solana once I build a stand for it. I plan to use just the drop in the back chamber for the filtration. My other system is a mixed reef in a 60g cube with a 30g sump. it's been running for the past 4-5 months with just a scrubber and skimmer. 20g water changes about every 2 months. I'm turning down the skimmer slowly. It's barely collecting anything now but I still haven't gotten the nerve to take it out. Skimmers don't remove any nutrients, so it does not affect the scrubber. Periphyton is what turns your rocks different colors. You know... the white rocks you started with in SW, or the grey rocks (or brown wood) you started with in FW. After several months or years, the rocks become a variety of different colors and textures. Why? Because the periphyton that has grown on it is a mix of different living things, of different colors, and thicknesses. And the important part is: It is LIVING. And the thicker it is, the more natural it is. That's right: The colored stuff that has coated your rocks is all living organisms. Sponges, microbes, algae, cyano, biofilms, and of course coralline. After all, "peri" means "around the outside", and "phyto" means "plant". Ever slipped while walking on rocks in a stream? That's probably periphyton that made it slippery. It's a very thin coating on the rocks, sometimes paper thin. There is a lot of photosynthetic organisms in periphyton, and this of course means that they need light; but they need nutrients too (ammonia, nitrate, phosphate). And as you might figure, they will be on the illuminated portions of the rocks. And they will grow to intercept food particles in the water, based on the water flow. Just think about how sponges orient their holes for water flow; the micro sponges in periphyton do it too but on a tiny scale. What about under the rocks, in the dark areas? Well these periphyton don't get light, so they are primarily filter feeders. So they REALLY grow and position themselves to be able to intercept food particles. And they don't really need to fight off algae, because algae does not grow in the dark, so they have no need for anti-algae tactics like periphyton in illuminated areas has. Reef studies have shown that at certain depths, more of the filtering of the water comes from periphyton and benthic algae than comes from the phytoplankton which filters the deeper water. And in streams, almost all the filtering is done by periphyton. So, what you have on rocks that are "mature" or "established" is a well-developed layer of periphyton; and all the things that comes from it. This is why mandarin fish can eat directly off the rocks of an "established" tank (tons of pods grow in and consume the periphyton), but not on the rocks of a new tank. Or why some animals can lay their eggs on established rocks, but not new ones. Or why established tanks seem to "yo-yo" less than new ones. Even tangs can eat periphyton directly when it's thick enough. Yes periphyton can also develop on the sand, but since the sand is moved around so much, the periphyton does not get visible like it does on rocks. So thick periphyton on established rocks is your friend. And totally natural too. That's why there are no pure white rocks in reefs. Keep in mind though I'm not referring to nuisance algae on rocks; I'm only referring to the very-thin layer of coloring that coats the rocks. But what happens when you "scrub the stuff off your rocks"? Well you remove some of the periphyton, which means you remove some of your natural filter and food producer. What if you take the rocks out of the water and scrub them? Well now you not only remove more of your natural filter and food producer, but the air is going to kill even more of the microscopic sponges in it. And what if you bleach the rocks? Well, goodbye all filtering and food producing for another year. It's an instant reduction of the natural filtering that the periphyton was providing. However, what if you just re-arrange the rocks? Well, some of the periphyton that was in the light, now will be in the dark; so this part will die. And some of the periphyton that was in the dark will now be in the light, so it will not be able to out-compete photosynthetic growth and thus will be covered and die too, for a while anyway. And even if the light stays the same, the direction and amount of water flow (and food particles) will change; sponges that were oriented to get food particles from one direction will now starve. So since the light and food supply is cut off, the filtering that the periphyton was providing stops almost immediately, due only to your re-arranging of the rocks. Starvation takes a little longer. The periphyton organisms won't die immediately, since they have some energy saved up; but instead, they will wither away over several weeks. So on top of the instant reduction in filtering that you get by just moving the rocks, you get a somewhat stretched-out period of nutrients going back into the water. And after all this, it takes another long period of time for the periphyton to build up to the levels it was at before: 1 to 2 years. Even changing the direction of a powerhead will affect the food particle supply in the area it used to be pointed at. So a good idea is to try to keep everything the same. Pick your lighting, flow, layout, and try to never move or change anything. In other words, just like the rocks on a reef. It's a different way of thinking, but you should have a stronger natural filter and food producer because of it.